I can hardly believe it’s less than 2 weeks before I’ll be heading off to Canberra for Congress 2015. It seems like just yesterday I booked an early-bird ticket and assured myself I’d be a very good organised person and would prepare adequately well in advance. Which seems a little funny now. In a scary kind of way. Now, the Oh my goodness, it’s less than two weeks before Congress has a different tone to it than it should! Not that I’m not excited. Because I definitely am. Especially as it’s my first Congress. But when I first booked, I had grand plans. I was going to scour my research notes to make sure I had a productive plan for what to do with my extra time in Canberra. Including research, general leisure and catching up with friends. I was going to make sure I’d looked over the parts of my research that were relevant to some of the sessions I expect to attend, and I was going to do some of the things mentioned in the many blog posts like this one that offer wonderful suggestions of what one should do in advance. But I’m sorry to admit that I’ve barely done a thing. 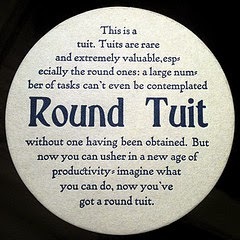 I could blame it on all the time my new job has sapped from me, or the many hours of driving to ferry my children to sporting activities, but (while they’re both definite contributors) the fact is that it has crept up on me, and I kept putting it off, assuming I’d get a round tuit later. On a positive note, I have a big fat tick against one of the things on Pauleen’s list: I have a good idea of what sessions I’m most interested in going to. While I do hope to spend some time in the next few days having a proper think about what I might like to research at the National Library of Australia, the National Archives of Australia and/or the Australian War Memorial, I’m not going to beat myself up about it if it doesn’t happen. What would be the point of that? Either way, I’m going to have a blast, learn a whole heap of new stuff, and meet new people. Which, in response to Jill Ball’s call for a pre-Congress blog-post, pretty much sums up my expectations for Congress. Look forward to meeting up again Tiggy. I didn't have yu on my list for Blogger Beads, I hope you'll be happy to wear them. Ditto Jill, and sure, I'd be happy to wear your beads.